Intra- and intermolecular spreading of T cell responses to autoantigens has been implicated in the pathogenesis of autoimmune diseases. Therefore, we questioned whether T cell responses from subjects identified as at-risk (positive for autoantibody reactivity to islet proteins) for the development of type 1 diabetes, a cell-mediated autoimmune disease, would demonstrate intermolecular Ag spreading of T cell responses to islet cell proteins. Previously, we have demonstrated that by the time subjects develop type 1 diabetes, they have T cell responses to numerous islet proteins, whereas T cells from normal controls respond to a limited number of islet proteins. Initial testing of PBMC responses from 25 nondiabetic at-risk subjects demonstrated that 16 of the 25 subjects have PBMC responses to islet proteins similar to controls. Fourteen of these 16 subjects were available for follow-up. Eleven of the 14 developed T cell responses to increasing numbers of islet proteins, and 6 of these subjects developed type 1 diabetes. In the nine subjects who already demonstrated T cell Ag spreading at the initial visit, four were available for follow-up. Of these four, two had increases in T cell reactivity to islet proteins, while two maintained their initial levels of T cell reactivity. We also observed Ag spreading in autoantibody reactivity to islet proteins in nine of the 18 at-risk subjects available for follow-up. Our data strongly support the conclusion that intermolecular spreading of T cell and Ab responses to islet proteins occurs during the preclinical period of type 1 diabetes. In recent years it has become increasingly recognized that the development of autoimmune disease is accompanied by acquired recognition of new self determinants or epitopes, a process referred to as intra- and intermolecular Ag spreading (1, 2, 3, 4, 5, 6, 7, 8, 9, 10, 11, 12, 13, 14). More importantly, there is growing evidence implicating inter- and intramolecular Ag spreading not just as a marker of autoimmune disease, but as involved in the pathogenesis of autoimmune diseases (5, 6, 11, 15, 16, 17, 18, 19, 20, 21, 22, 23). Type 1 diabetes is a T cell-mediated, organ-specific autoimmune disease. During β-cell destruction, proteins from β-cells presumably become accessible and stimulatory to the immune cells of the type 1 diabetes patient. Intermolecular spreading of the humoral responses toward islet proteins has been demonstrated in type 1 diabetes patients and subjects at risk of developing type 1 diabetes (24, 25, 26, 27, 28, 29, 30). In fact, positivity for multiple islet autoantibodies is associated with a greater risk of developing type 1 diabetes than positivity for one autoantibody (12, 13, 24, 25, 26, 27, 28, 29, 30). However, the pathogenesis of type 1 diabetes is believed to be cell mediated, because T cells, but not Abs, can transfer disease in animal models and human type 1 diabetes (31, 32, 33, 34, 35). Therefore, it is of importance to study whether intra- and intermolecular spreading of T cell responses to islet proteins occurs in the development of type 1 diabetes. We and others have previously reported that newly diagnosed type 1 diabetes patients and autoantibody-positive type 2 patients have T cells reactive to a wide spectrum of islet proteins at the time of clinical diagnosis (36, 37, 38, 39, 40), suggesting that intermolecular Ag spreading had occurred before the diagnosis of clinical disease in humans. In this study we investigated whether subjects at-risk for the development of type 1 diabetes would demonstrate intermolecular spreading of the T cell reactivity to islet proteins during the preclinical period of type 1 diabetes. Our data strongly support the conclusion that intermolecular Ag spreading of both humoral and cellular responses to islet proteins occurs during the preclinical diabetic period and is an important component of the autoimmune pathogenesis of human type 1 diabetes. These studies were approved by the human subjects review committee of the University of Washington and the Diabetes Prevention Trial Type 1 ancillary studies committee. Sixty-one normal control subjects were without chronic illness and comprised 36 women and 25 men with a mean age ± SD of 29.4 ± 7.8 years (range, 18–50 years). In our studies of recently diagnosed (within 1 year of diagnosis) type 1 diabetes patients and long term (3–65 years after diagnosis) type 1 diabetes patients, we have observed that T cell reactivity to multiple islet proteins is present within the first year after diagnosis in all type 1 patients. However, more variable T cell responses to islet proteins were observed in patients studied more than 1 year after diagnosis. Therefore, all type 1 diabetic patients donated blood within 1 year of diagnosis. Sixty-two recently diagnosed type 1 diabetes patients (31 men and 31 women; mean ± SD age, 21.8 ± 8 years old; range, 7–35 years) were studied. Subjects were identified as at-risk for type 1 diabetes based on the presence of one or more islet autoantibodies. Six of the at-risk subjects were enrolled in the control group of the parenteral insulin arm of the Diabetes Prevention Trial Type 1. Personal data for the 25 at-risk subjects are provided in Table I⇓. At-risk subjects were studied longitudinally for an average of 30 mo. Controls were studied for an average of 20 mo. Cellular immunoblotting was performed as previously described for islets (36, 38, 41), and nonislet proteins (10, 42, 43). Briefly, human pancreata were obtained by University of Washington transplant surgeons, and pancreatic islets were isolated within 48 h postmortem at the Tissue Core of the Diabetes Endocrinology Research Center, University of Washington (Seattle, WA). Islet cells and tetanus toxoid (gift from Connaught Laboratories, Swiftwater, PA) were subjected to preparative 10% SDS-PAGE (44). Following electrophoresis, the gels were electroblotted onto nitrocellulose (Bio-Rad, Richmond, CA) at 30 mA overnight and cut into 18 m.w. regions spanning the spectrum from 200 to <14 Kd (36, 38), and nitrocellulose particles were prepared (45) and used to stimulate PBMC in vitro. Unfractionated PBMCs (3.0 × 105cells/well) were placed in flat-bottom 96-well tissue culture plates (Costar, Cambridge, MA). To each tissue culture well 100 μl of nitrocellulose particles from an individual m.w. region (blot section) containing islet cell proteins or tetanus toxoid was added. The cultures were prepared in triplicate and incubated for 6 days at 37°C in 5% CO2. PHA or Con A was added to control wells on day 4 of culture. After 6 days [3H]thymidine (1 μCi/well) was added, and the cultures were incubated for 8 h. The cultures were harvested using a Tomtec 96-well cell harvester and counted using a Betaplate (LKB Pharmacia, Piscataway, NJ) liquid scintillation counter. A stimulation index (SI)3 for each m.w. region was calculated as follows: SI = mean cpm experimental wells/mean cpm control wells. Control wells contained nitrocellulose particles without Ag. Positive proliferation was considered to be an SI >2.0, which corresponds to greater than the mean ± 3 SD of control values (36). As previously reported (36), the average intrasubject coefficient of variation for this methodology is ∼22%. Ag doses and specificity of PBMC responses of type 1 diabetes patients to the islet protein preparations and known islet autoantigens using cellular immunoblotting have been previously described (36). PBMC responses to tetanus toxoid were used as a control Ag along with the PBMC responses to mitogens that were included to test for viability of the cultures. PBMC responses of type 1 diabetes patients, autoantibody-positive type 2 diabetes patients, autoantibody-negative type 2 diabetes patients, and controls to tetanus toxoid have been shown to be similar (36, 38). The ICA assay was performed as described previously (36). Our laboratory has participated in the International Diabetes Workshop and the International Diabetes Society-sponsored workshops and proficiency programs for ICA with a sensitivity of ∼63% and a specificity of 100%. The lower detection limit for our ICA assay is 1 Juvenile Diabetes Foundation (JDF) unit, and the 99th percentile established from ∼4000 normal school children is 4 JDF units. GAD65 Ab were measured in a radiobinding immunoassay on coded serum samples as described previously (46). The levels of GAD65 Ab were expressed as a relative index (GAD65 index) using one positive serum (JDF World Standard for ICA) and three negative standard sera from healthy subjects. The GAD index was calculated and a positive was considered ≥0.04, which is the 95th percentile based on 200 normal controls. We have participated in the International Diabetes Workshop proficiency program for GAD65, with a sensitivity of 100% and a specificity of 100%. Autoantibodies to IA-2 were measured under identical conditions as described for GAD65 Ab (46). The plasmid containing the cDNA coding for the cytoplasmic portion of IA-2 was donated by G. Eisenbarth, Barbara Davis Research Center (Denver, CO). The same JDF standard serum and control sera as in the GAD65 Ab assay were used to calculate the IA-2 Ab index for each sample. An IA-2 index ≥0.01, the 95th percentile based on 200 normal controls, is taken as the cut-off for positivity. The IAA assay is performed as described previously (36). Specimens are run in duplicate. We have participated in the International Diabetes Workshop, and the International Diabetes Society-sponsored workshop and proficiency programs for IAA with a sensitivity of ∼100% and a specificity of 100%. Unpaired t tests were performed to determine the significance between groups and between initial and latest autoantibody and T cell responses to the islet proteins among the groups (controls and high risk subjects). All subjects were tested for the presence of four autoantibodies (ICA, GAD, IA-2, and IAA) at each visit. 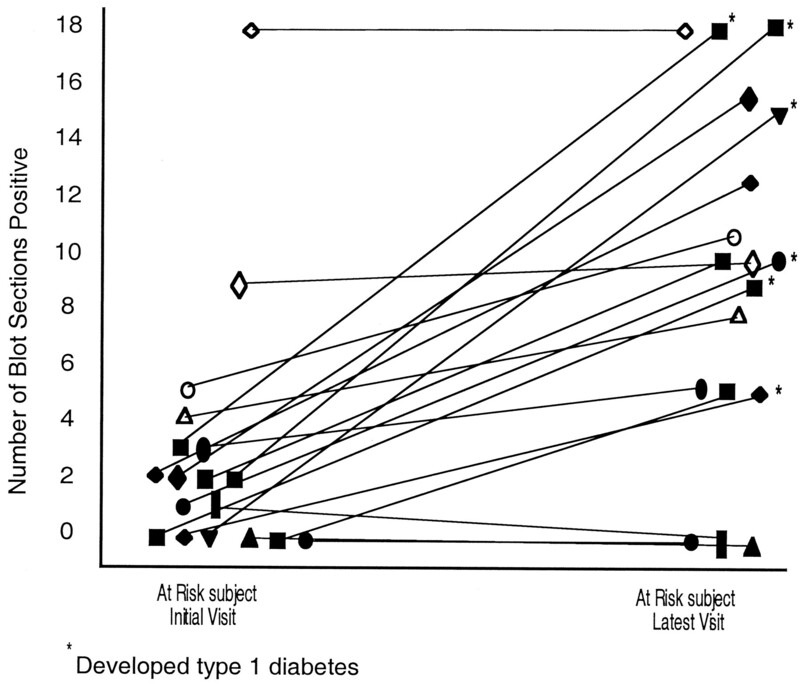 Of the 25 at-risk subjects, seven developed clinical type 1 diabetes. Of these seven, one subject initially positive for ICA alone became positive for all four autoantibodies, one subject initially positive for GAD alone became positive for all four autoantibodies, two subjects positive initially for ICA and GAD developed positivity for all four autoantibodies, one subject positive for ICA alone became positive also for GAD and IAA, one subject positive for GAD and IA-2 lost reactivity for IA-2 and developed reactivity for ICA, and one subject who tested positive for all four autoantibodies upon the initial visit developed clinical diabetes 3 mo post testing. Of the 18 subjects that have not developed clinical type 1 diabetes, nine (total, 25) demonstrated an increase in the number of autoantibodies positive (of the four tested). Personal data and autoantibody status of the 25 at-risk subjects are summarized in Table I⇑. Changes in autoantibody responses between initial and follow-up testing are identified in the table. The increase in the numbers of autoantibodies in at-risk subjects between the initial and latest visits was highly significant (p < 0.0001). T cell responses for normal controls (n = 61) and recently diagnosed (<1 year) type 1 diabetic patients (n = 62) to the separated islet proteins are illustrated in Fig. 1⇓. Normal controls were observed to have PBMCs responsive to 0–3 (mean, 0.84 ± 0.96) of the 18 m.w. regions containing islet proteins (blot sections), whereas the PBMCs from type 1 diabetic patients responded to 4–18 (mean, 11.3 ± 4.5) m.w. regions (p < 0.0001). Evaluating the data from the diabetic patients for a possible difference related to gender or age revealed no significant differences in the number of blot sections positive in males vs females. Moreover, when evaluating the data for possible differences related to age, no significant differences were observed in patients diagnosed less than or greater than 18 years of age. The number of m.w. regions containing separated islet proteins stimulatory to PBMC responses of controls (n = 61; ♦) and type 1 diabetic patients (n = 62; ○). A positive response is taken as SI >2.0. Different symbols represent different individuals’ responses. Follow-up T cell data are available to date for 18 of the 25 at-risk subjects. Fig. 2⇓ illustrates the PBMC responses of the 18 at-risk subjects to the m.w. regions upon initial testing and again at the most recent follow-up testing. At initial testing, PBMCs from 16 of the 25 subjects responded to zero to three m.w. regions (mean, 1.19 ± 1.2) similar to the PBMC responses of normal controls. Of these 16 subjects, 14 were available for subsequent testing (Fig. 2⇓, solid symbols). Eleven of these 14 subjects, developed PBMC responses to increasing numbers of m.w. regions (mean, 10.3 ± 4.98), and six of these subjects developed clinical type 1 diabetes (denoted by asterisks on figure). The other subject who developed clinical type 1 diabetes responded to 18 m.w. regions upon initial testing and developed clinical disease 3 mo post testing. Three subjects who had PBMCs that were unresponsive, zero or one blot section, upon initial testing have remained unresponsive. Two of these individuals still respond to only one autoantibody; however, the other individual has become autoantibody negative (initially positive for two autoantibodies). PBMC responses of 18 nondiabetic autoantibody-positive subjects designated as being at-risk for the development of type 1 diabetes with follow-up data. The number of m.w. regions stimulatory to PBMCs for each individual at their initial and latest testing are shown. The different symbols represent individual subjects, with a line connecting the initial and latest follow-up visits. A positive PBMC proliferative response to the separated islet proteins was taken as SI >2.0. Nine of the 25 at-risk subjects, upon initial testing, had PBMCs that responded to more than three m.w. regions (mean. 12.4 ± 6.0). Of these nine subjects, four were available for follow-up (Fig. 2⇑, open symbols). Of these four, two subjects had increases in the number of m.w. regions recognized (one from 5 to 10, and one from 4 to 7), one subject continues to respond to nine m.w. regions, and one subject continues to respond to 18 m.w. regions. The numbers of m.w. regions containing islet proteins stimulatory to PBMCs from the 25 nondiabetic subjects at-risk for the development of type 1 diabetes are summarized in Table II⇓. T cell responses to islet proteins were significantly less in at-risk subjects at their initial visit compared with those in the type 1 patients. Differences between type 1 patients and at-risk subjects at their latest visit were not significant, but the T cell responses of the at-risk subjects at their latest visits were significantly greater than those in the controls. Longitudinal data for the PBMC responses to the islet proteins from 10 normal controls studied over the same time period as the at-risk subjects described above (mean follow-up time, 20 mo) are shown in Fig. 3⇓. 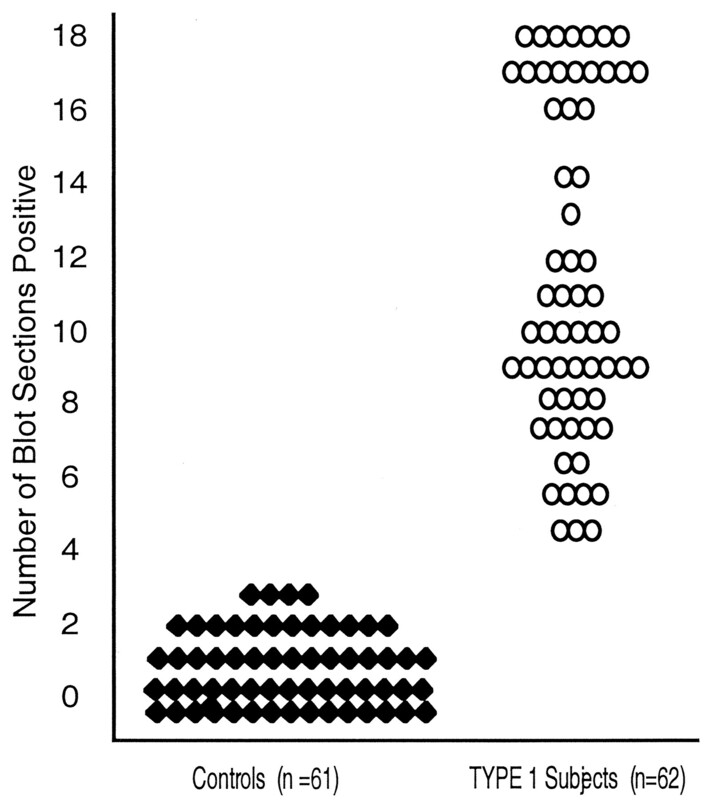 The maximum number of blot sections containing islet proteins recognized by PBMCs from controls was three m.w. regions. In contrast, the PBMC responses of the 18 at-risk subjects available for follow-up (mean follow-up time, 30 mo) varied from 0–18 m.w. regions (Fig. 4⇓). 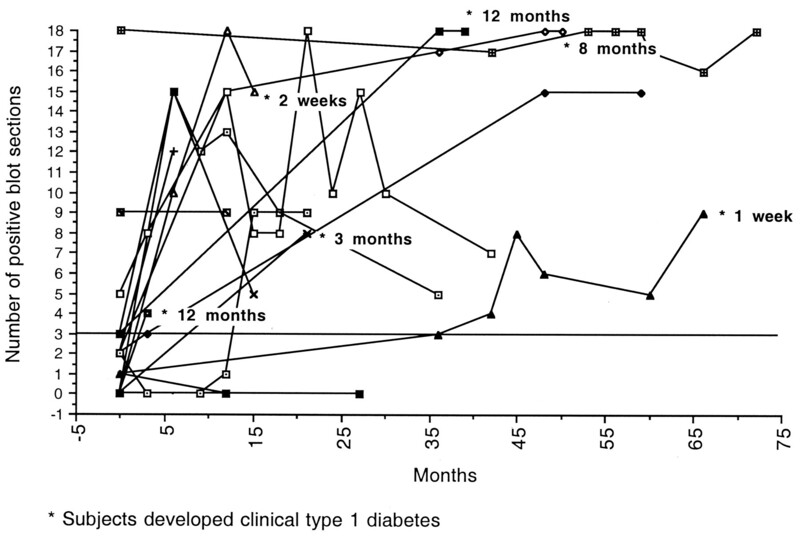 For the subjects who developed clinical diabetes, the length of time from the last sampling to the development of clinical disease is noted on the figure. 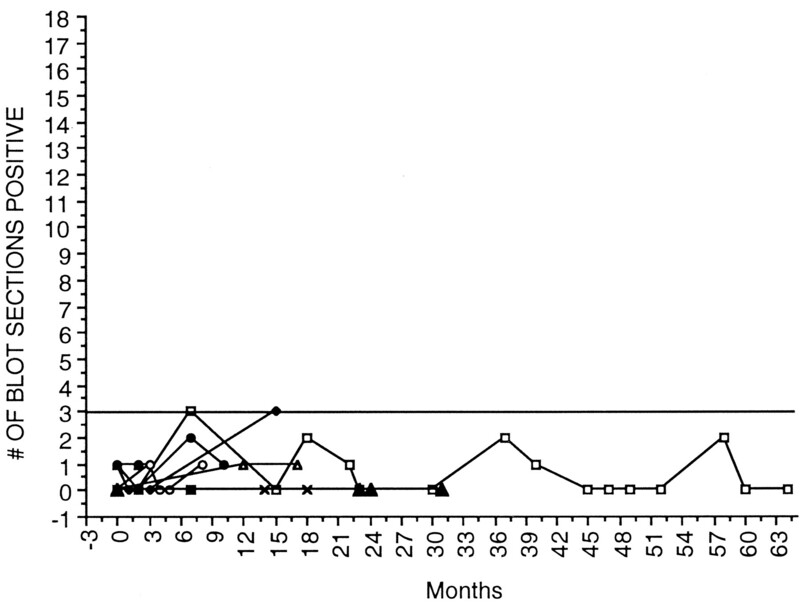 PBMC responses over time of 18 autoantibody-positive subjects available for follow-up. The number of m.w. regions stimulatory for each individual initially and at follow-up visits are shown. The different symbols represent individual subjects, with a line connecting the follow-up visits. A positive PBMC proliferative response to the islet proteins was taken as SI >2.0. Subjects developing clinical type 1 diabetes are identified by an asterisk along with the time of development of diabetes. PBMC responses of 10 normal controls over time. The number of m.w. regions stimulatory for each individual initially and at follow-up visits are shown. The different symbols represent individual subjects, with a line connecting the follow-up visits. A positive PBMC proliferative response to the islet proteins was taken as SI >2.0. Intra- and intermolecular Ag spreading have been recently implicated in the pathogenesis of autoimmune diseases (5, 6, 11, 15, 16, 17, 18, 19, 20, 21, 22, 23). Intra- and intermolecular Ag spreading of T cell responses has also been demonstrated in the nonobese diabetic (NOD) mouse, an animal model for type 1 diabetes (18, 19, 41, 47). Kaufman et al. (18) demonstrated that T cell responses to GAD could be detected in 4-wk-old NOD mice concurrent with the onset of insulitis. These authors observed intramolecular spreading of T cell reactivity to the GAD molecule as well as intermolecular spreading to other islet proteins as the disease progressed. Similarly, Tisch et al. (19) demonstrated a very early T cell response to GAD and spontaneous T cell responses to increasing numbers of islet cell proteins as the type 1 diabetes disease progressed in the NOD mice. Moreover, it appears that in the NOD mouse, halting the Ag spreading cascade can protect NOD mice from insulitis and clinical disease (18, 19). In human type 1 diabetes, Ag spreading has also been demonstrated for humoral responses (11, 12, 13). In fact, intermolecular spreading in autoantibody responses of subjects at risk for the development of type 1 diabetes is associated with an increased risk of developing type 1 diabetes (11, 12, 13, 24, 25, 26, 27, 28, 29, 30). With regard to T cell responses, it has become increasingly recognized that newly diagnosed type 1 diabetes patients have T cells that respond to numerous islet cell proteins at the time of diagnosis (14, 36, 37, 38, 39, 40). Thus, it appears that intermolecular Ag spreading occurs before the diagnosis of clinical disease. Therefore, we wanted to investigate the T cell reactivity to islet proteins of subjects identified to be at risk for the development of type 1 diabetes before the development of clinical disease. We observed T cell responses to increasing numbers of islet proteins over time in 14 of the 18 subjects. Seven of the at-risk subjects have developed clinical type 1 diabetes to date. Six of these seven demonstrated intermolecular Ag spreading with regard to both T cell and autoantibody responses to islet proteins before developing clinical type 1 diabetes. The other subject upon initial evaluation had maximal autoantibody and T cell responses to the islet proteins and developed clinical type 1 diabetes 3 mo post testing. In our study we used cellular immunoblotting to investigate the T cell responses to a wide spectrum of islet proteins. The use of cellular immunoblotting permitted us to follow the increasing T cell reactivity to numerous islet cell proteins and the variability in the T cell responses to the islet proteins among the at-risk subjects over time. There appears to be a correlation between the increasing number of autoantibodies and the increasing number of islet proteins recognized by the T cells of the at-risk subjects. Currently, HLA, autoantibodies, and β-cell function are used to assess individuals at risk of developing type 1 diabetes. However, additional measurements of T cell reactivity to a panel of islet proteins will probably further improve this risk assessment. Our data strongly support the conclusion that intermolecular Ag spreading of the humoral and cellular responses to islet proteins is occurring before the onset of human clinical type 1 diabetes. Moreover, the Ag spreading associated with the development of type 1 diabetes appears to be an important component of the autoimmune pathogenesis of human type 1 diabetes. Thus, identification of Ag spreading may be useful to determine the risk for developing clinical disease and to assess the immunologic effects of interventions aimed at altering the type 1 disease process. We extend our sincere thanks to Rick Mauseth for providing the majority of the newly diagnosed type 1 diabetes patients, and David McCulloch and the Diabetes Prevention Trial Type 1 study group for making available some of the at-risk subjects for this study. We also thank Marli McCulloch-Olson for her assistance with the recruitment and scheduling of the study subjects. Also, we thank Connaught Laboratories for supplying the tetanus toxoid, and Dr. G. Eisenbarth (Barbara Davis Research Center, Denver, CO) for supplying the plasmid containing the cDNA coding for the cytoplasmic portion of IA-2. ↵1 This work was supported in part by the Medical Research Service of the Department of Veterans Affairs and grants from the National Institutes of Health (P30DK17047, PO1DK53004, and M01RR00037). ↵3 Abbreviations used in this paper: SI, stimulation index; NOD, nonobese diabetic; ICA, islet cell Ab(s); IA-2, islet cell autoantibody-2; GAD65, glutamic acid decarboxylase; IAA, insulin autoantibody; JDF, Juvenile Diabetes Foundation. Greenbaum, C. J., B. M. Brooks-Worrell, J. P. Palmer, A. Lernmark. 1994. Autoimmunity and prediction of insulin dependent diabetes mellitus. S. M. Marshal, and P. D. Home, eds. In Diabetes Annual Vol. 8: 21 Elsevier, Amsterdam.